The day our world stopped. The day we were told that part of our baby boy's brain had not formed. The day we had to make the most unimaginable decision of our lives. We were scheduled into the high risk pregnancy hospital that afternoon for a number of tests because an ultrasound had shown that the ventricles in our baby's head were larger than normal. My husband and I made the 1/2 hour drive into Toronto and, to be honest, our spirits were hopeful. We certainly had a million questions, but how bad could it be right? I was 33 weeks and had several ultrasounds throughout the pregnancy - every single one was "fine" - until the last one. How could something so catastrophic not been seen earlier?? When we got to the clinic I had blood taken, then we had the amnio... and then the "detailed ultrasound" performed by one of the head doctors. He studied our baby for a long, long time (all the while making small talk). I remember him telling us about his daughter and a big house they had bought not too far from where we lived...I look back now and wonder how in the world he could talk so casually when he could clearly see the trouble our baby was in. The doctor was called away for what felt like hours and during that time my husband and I tried to remain calm... we didn't know anything for sure at this point. My husband looked at the transcript from the previous ultrasound and figured things were fairly positive (he has some training in the medical field and can read the jargon). When the doctor finally returned he probed my belly again and asked if he and the doctor we had been seeing (who was now in the room) could speak with each other freely. Sure. I didn't understand a single thing they were saying, but something deep in my soul knew that none of it was good. I kept looking at my husband for some kind of reassurance.... nothing. He just kept shaking his head and looking really concerned. When my husband looks concerned I know there's trouble. The doctors finished up and we were sent to wait in the waiting room... for what we now know was the worst news of our life. "Part of the baby's brain has not formed at all" the words went through me like a sword. "There was some kind of insult to the baby", probably during or after my emergency surgery at 20 weeks, "There is a high chance that the baby will not make it through labour or for very long once he is born" .... my vision is blurry now, I am staring blankly at who knows what, I don't hear them anymore. "If the baby is born alive we cannot guarantee what quality of life he will have... with half the brain missing...." "Everyone has different views and ideas of what quality of life is....there are options for you." Options, are you serious??!!! After a while we were left alone in that office.... to scream, to sob, to shake uncontrollably. Our first and foremost thought was that we did not want our precious baby boy to suffer. We did not want him to be born gasping for breath, struggling to stay alive. We did not want him on life support and we did not want our beautiful boy to be attached to tubes and needles. We also felt like we had to think about our two boys at home... there were 5 people to think about. I will never forget my husband saying that. I don't remember too much, but that I remember. It struck a chord and resonated in my breaking heart. The decision to let him go, without a doubt, was the most heart-wrenching, soul-searing, horrendous decision we have had to ever, ever had to make, but I truly believe we made it out of love. I have to believe that we spared him the pain, the suffering that he would have inevitably endured, regardless of the outcome. I pleaded with the doctors not to send me home that night.... I really didn't know how to face anyone. But there are policies, of course. We were sent home to writhe in our pain... to start grieving our little boy who was still actively kicking and pushing his mommy's belly. We waited 4 days to get an MRI scheduled. The MRI was to 110% confirm the findings (which we were all for). That was Friday, October 31, 2008 - Halloween Day. And that is for another post. Every year around this time I struggle. The tears flow without warning. There is a dull ache in my chest and my breaths are a little harder to take. The vulnerability I feel at this time is painstaking. Unstoppable. Agonizing. I try my very hardest to honour you, sweet Nicholas. To keep your beautiful legacy alive in this world. I try to give back to others hurting as we do. I do it in your name. I do it because you gave me clarity to what I could give back in this life. You were taken away. I am still here. My resolve is to parent you through comforting others. To allow my love for you honour other babies gone too soon. To offer support and strength to their families. To remember you with purity and passion. But the anniversaries come with pain and sorrow. The subconscious memories blindside me and I am left to pick up the pieces. The rest of the year is dedicated to honouring your beautiful little life.... but today, little man, mommy is struggling. Nicholas’ Birth/Angel day is Thursday, Novemeber 7th. It will have been 5 whole years since Jim and I had the incredible opportunity to meet our third son, face to tiny, perfect face. 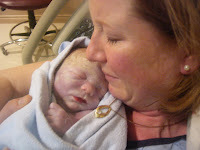 Five years since we were blessed to hold him in our arms… smell him… kiss him….talk to him… love him. I am struggling with 5 years. Every year is a milestone, but 5 seems truly unimaginable. When Nicholas died I remember genuinely wondering how the world could continue to spin… how the stars still shone… how the birds still sang… Our world was drastically halted in that moment and it seemed beyond unfair and cruel that time didn’t stop. I couldn’t be more grateful for time. Time to dull the intense pain. Time to begin to heal our broken hearts. Time to try to forgive myself. Time to remember and honour Nicholas. Time to realize how much love he has brought to our lives. Most of you will remember that we have been marking Nicholas’ Angel Day with a special and unique event each year. Together, with an amazing support system, we have created life long memories on what is an extremely emotional day for our family. This year we will be travelling to Ottawa on November 7th. To be honest, I have had a hard time accepting this truth, however, we have come up with a plan to continue our tradition of honouring Nicholas’ memory on his birth/angel day. I have been busy putting together more Comfort Boxes. We will donate 6 of them to a hospital close to where we are staying in Ottawa. We are more than comforted to know that some families may find some much needed solace from the items we have provided. I am saddened by the fact that we will not have the opportunity to again share this day with an abundance of friends, family and supporters. However, I am encouraged to know that we will be surrounded by our “hockey family” as we navigate our way through this latest anniversary. In the past, the events have changed, as it will this year, but the meaning will always be there. It is so important to us to have a positive focus on what could be a terrible day re-living horrific memories. Nicholas’ legacy lives on and that is what it is all about. We continue to heal our broken hearts by remembering and honouring our special little guy every day. We do this together, with love, perseverance and with the boundless support of amazing family and friends who have been there for us every step of the way. We thank you all.